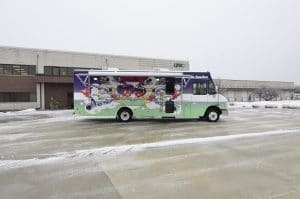 Dane County Library Service’s new bookmobile is a conversation starter for sure. 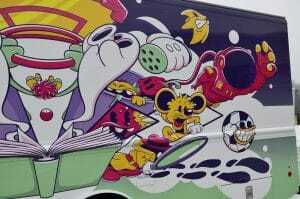 When it came time to design the wrap for their new vehicle, they partnered with a local artist to do the illustration. But it wasn’t solely his help. The Library Service and the artist looked to a younger generation for their inspiration. –Cory Weithaus, LDV Outreach Sales Representative. When it came time to design their latest vehicle with us, Dane County knew they wanted certain features integrated into the interior. Both the driver and passenger seats were upgraded to plush, fully-adjustable units for maximum comfort while out on the route. For book shelves, they chose white powder coated Acore modular aluminum shelving. Acore shelving is durable and allows for the layout to be reconfigured as needed. There are 2 countertop/check-out areas: one with a flip-down counter section for staff which also accommodates a book return cart underneath, a couple of dry erase white boards, an L-shaped, black-stained oak magazine rack and interior audio speakers. They also wanted a bright and inviting interior so they added several windows to both the sides and the rear of the vehicle and the entry door has dual windows. The addition of a skylight on the roof is also a nice touch to add even more light. Let’s not forget the color-changing LEDs integrated into the ceiling. The outside of their bookmobile is all about fun. A 49″ Samsung LED smart tv housed within a weatherproof enclosure allows for outdoor movies while the exterior audio system allows the Library System to crank some tunes. Color-changing LEDs can be set to pulse and flash to the music. How fun! Dane County also opted for a retractable awning to provide shade during the hot Wisconsin summer months. Several external storage boxes were integrated into the body along with a potent, yet quiet, Onan 7kW commercial generator. 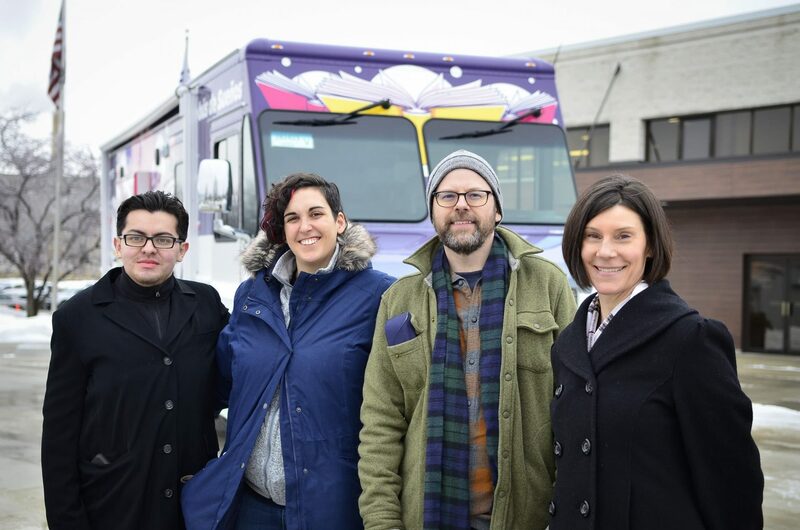 Dane County designed an awesome bookmobile that they can be proud of. 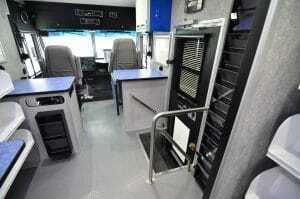 We can’t wait to see photos of the new truck once it’s been put into service. 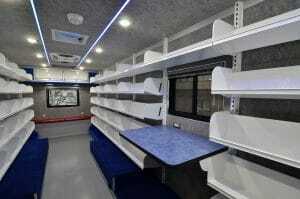 This is Dane County’s second LDV-built bookmobile.